Predator Base Layers are designed with the player in mind; regulate your body temperature to maintain performance with our base layers. Made with 200gsm Italian sports spandex, our baselayers benefit from technical wicking properties to regulate your body temperature while you’re playing. Every inch of your bespoke base layers is customisable with sublimation printing. Colours won’t fade and the ink is pressed into the fabric to give a professional feel. 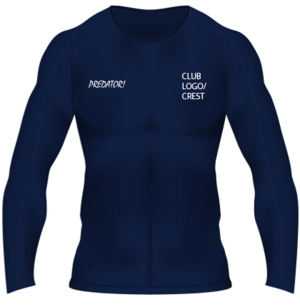 We are proud to offer completely bespoke baselayers in both short sleeved and long sleeved variations, as well as leggings. Base Layers cannot be ordered online. Minimum Order quantity is just 10. Use the charts, in the photos, to calculate your required sizes. You will need to supply good quality artwork of required badges/logos etc.